Gamblogger: Let the March Madness Betting Begin! Selection Sunday is now behind us and March Madness betting has begun! At this point there are 68 teams playing for the American college basketball title and Intertops Sportsbook bookmakers say it's the Florida Gators that are seeing the most action so far. The Gators ran the SEC table, going 18-0, and continued a winning streak that spanned most of December, all of January, all of February and into March. Odds on Florida, the No. 1-ranked team in NCAA Men's Division I Basketball, to win the championship are currently 5.50. Naturally sportsbooks are making all kinds of bonus offers to get our business during this busy betting period. 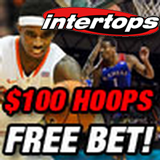 Intertops Sportsbook has rolled out a couple of good ones for those of us that bet on March Madness. There's a $100 March Madness Free Bet and a $100 March Madness Bonus. A 20% up to $100 bonus will be added to all deposits made between now and March 25th. Everyone wagering $1,000 at minimum odds of -200 / 1.5 on the NCAA Men's Division 1 Basketball Championship tournament by the end of the regional tournaments on March 30th can claim a $100 Hoops Free Bet on Monday, March 31st. You can also enter their $25,000 Bracket Contest until Thursday this week.